Comes standard with basket, tray and pouch. Basket conveniently folds for easy storage. Comes with frame folded and compact. Pull lightweight aluminum trombone-style frame to lock in place and secure with lock knob. 7.5 in. casters for indoor or outdoor use. Handles easily adjust in height with self-threading knob. Special loop lock made of internal aluminum casting operates easily and ensures safety. Easy, one-hand folding. Casters: 7.5 in.. Handle height (Max): 38 in.. Handle height (Min): 31 in.. Number of wheels: 3. Weight capacity: 300 lbs.. User size: Universal. Allergy: Not made with natural rubber latex. Proposition 65 warning: This product contains a chemical known to the State of California to cause cancer, birth defects, or other reproductive harm. Made from aluminum. Made in China. 25 in. in. L x 24 in. in. W x 31 in. in. H (11 lbs.). Instructions Manual. 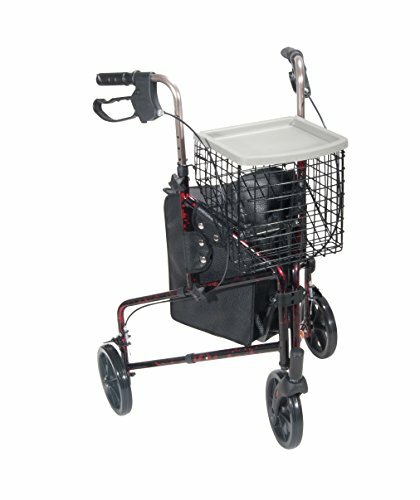 This 3 wheel rollator in red has a lightweight aluminum frame and comes standard with basket, tray and pouch. Easy one hand folding makes for simple storage. Easy to adjust handle height with self-threading knob. Lightweight solid 8" wheels for indoor and outdoor use. Comes standard with special loop locks made of internal aluminum casting to ensure safety. 4 Wheel Rollator, Lightweight Folding Blue Aluminum Frame, 6" Caster Wheels, Adjustable 32" to 37"